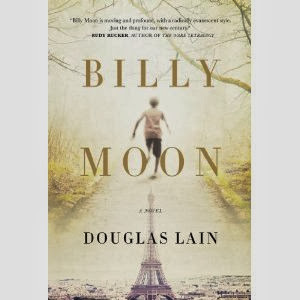 In Douglas Lain's debut novel set during the turbulent year of 1968, Christopher Robin Milne, the inspiration for his father’s fictional creation, struggles to emerge from a manufactured life, in a story of hope and transcendence. Billy Moon was Christopher Robin Milne, the son of A. A. Milne, the world-famous author of Winnie the Pooh and other beloved children's classics. Billy's life was no fairy-tale, though. Being the son of a famous author meant being ignored and even mistreated by famous parents; he had to make his own way in the world, define himself, and reconcile his self-image with the image of him known to millions of children. A veteran of World War II, a husband and father, he is jolted out of midlife ennui when a French college student revolutionary asks him to come to the chaos of Paris in revolt. Against a backdrop of the apocalyptic student protests and general strike that forced France to a standstill that spring, Milne's new French friend is a wild card, able to experience alternate realities of the past and present. Through him, Milne's life is illuminated and transformed, as are the world-altering events of that year. In a time when the Occupy movement eerily mirrors the political turbulence of 1968, this magic realist novel is an especially relevant and important book. DOUGLAS LAIN's short fiction has appeared in many magazines and journals here and abroad. Since 2009, he has produced the weekly podcast Diet Soap, interviewing a wide range of fascinating, engaging people with insights for the new millennium: philosophers, mystics, economists, and a diverse group of fiction writers. He lives in Portland, Oregon, with his wife and children. I liked this book from the moment I saw it.A beautiful cover with a synopsis to draw me in. I was let down though. As I read, I often got frustrated. The book would go from being written with grace and elegance to becoming completely baffling, and back again. For me, this happened too much. It almost felt like it was each chapter or vignette. I'd be reading, get pulled in and BAM! Completely confused. I read a part to the hubby. As I read, I could visibly see him getting lured into the story, and I also noted the moment the confusion set in. Maybe this book is too sophisticated for a reader like me, I don't know, but I hope you will take this one opinion for what it is. One opinion. Read the book and formulate your own. You may be more into it than I.
Hi Freda! Hope all is well your way. Great review. Have a great week! This sounds really interesting. I know Christopher Robin Milne had a very difficult life because of his inclusion in his father's work and the year 1968 was a pivotal one for many people. I'd love to see how this book treats both these aspects of the story. Thanks.